The third day of the ESL Pro League Season 8 Finals is upon us, it’s been a fierce competition so far with six teams already eliminated. Yesterday’s match was a close series between teams MIBR and NRG going the full distance of three maps. MIBR ultimately pulled through in overtime on the third map securing the victory. However, NRG’s performance is nothing to slouch at, for today’s tip we will be taking NRG’s side as they fight to stay alive against Ghost Gaming. NRG has the clear advantage in this matchup. Factors like a favoring map pool, well-performing players, and regional ranking show where these two teams stand when compared to one another. NRG is currently ranked 6th globally while Ghost sits down at the 25th spot. Ghost Gaming has made leaps and bounds establishing themselves in the international scene. Though not performing when put under tournament pressure. Ghost Gaming is made up of a younger generation of players and nerves have always had an impact on their play. For this reason and the fact that NRG almost bested an on-fire MIBR, NRG will pull off this victory. 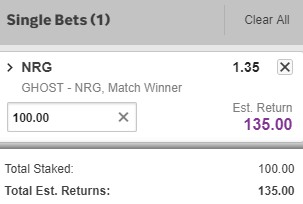 Betting tip / Prediction: NRG wins the match.